This upcoming Friday, the Computer Arts Club will be having a very special guest, Steve Stanchfield, over to host a workshop. Steve is a character animator, animation director, and animation historian. He co-owns the company, Thunderbean Animation, which creates animation and restores classic animated films for blu-ray release. 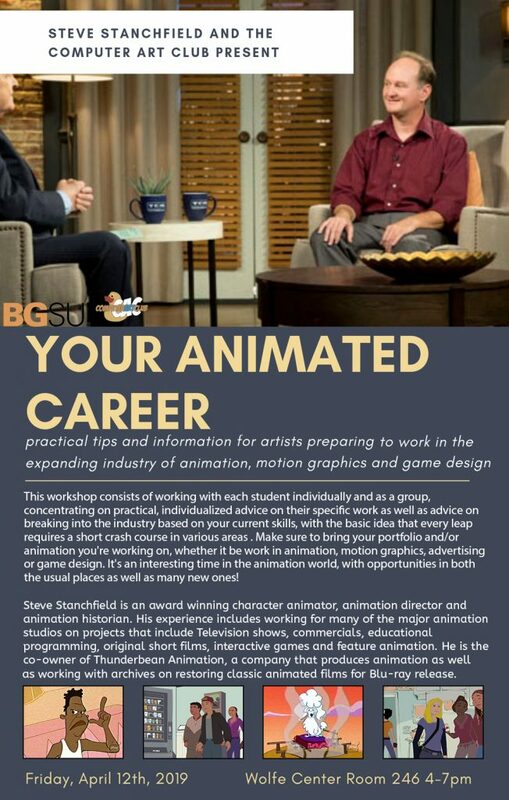 Steve will be Giving a lecture about how to prepare to work in the animation industry. He will also be critiquing student work, so be sure to bring your portfolios. This workshop will take place this Friday, April 12, 2019, in Wolfe Center lab 244, from 4:00-7:00pm. We hope to see you there.